The Katipunan (abbreviated to KKK) was a Philippine Revolution. The white supremacist group known as the Ku Klux Klan who are also associated with the acronym "KKK". Being a Propaganda Movement in the Philippines. Katipunan founders Andrés Bonifacio, Ladislao Diwa, and Teodoro Plata were all members of La Liga and were influenced by the nationalistic ideals of the Propaganda Movement in Spain. Philippine Masonry; most of the Katipunan's founders were freemasons. The Katipunan had initiation ceremonies that were copied from masonic rites. It also had a hierarchy of rank that was similar to that of freemasonry. Rizal's Spanish biographer Wenceslao Retana and Filipino biographer Juan Raymundo Lumawag saw the formation of the Katipunan as Del Pilar's victory over Rizal: "La Liga dies, and the Katipunan rises in its place. Del Pilar's plan wins over that of Rizal. Del Pilar and Rizal had the same end, even if each took a different road to it." Artigas y Cuerva, Manuel (1911). "Andres Bonifacio y el Katipunan". La Vanguardia (Manila). Borromeo-Buehler, Soledad Masangkay (1998). The Cry of Balintawak: a contrived controversy. Ateneo de Manila University Press. Cruz, Hermenegildo (November 16, 1922). Tamiko I. Camacho, Jerome Espinosa Baladad and PG Distributed Proofreaders, ed. Kartilyang Makabayan: Mga Tanong at Sagot Ukol Kay Andrés Bonifacio at sa KKK. Fernandez, Leandro H. (1926). The Philippine Republic. Fernandez, Leandro H. (1930). "Autobiography of Gregoria de Jesus". Philippine Magazine (Manila). Reynaldo, Ileto (1998). "Filipinos and their revolution: event, discourse, and historiography". Ateneo de Manila University Press. Guerrero, Milagros C. (1996). "Balintawak: The Cry for a Nationwide Revolution". Sulyap Kultura (Manila: National Commission for Culture and the Arts). Halili, Maria Christine N. (2004). Philippine History. Manila: Rex Book Store. Retana, Wenceslao. Vida y Escritorios de Dr. José Rizal. Madrid: 1907. This book was published by Ricarte himself, includes his memoirs on the Philippine Revolution. Sagmit, Rosario S.; Sagmit-Mendosa, Lourdes (2007). The Filipino Moving Onward 5 (2007 ed.). Rex Bookstore, Inc. .
Santos, Jose P. (1930). "Kung Sino si Jacinto". Pagkakaisa (Manila). Zaide, Gregorio F. (1957). Philippine Political and Cultural History: the Philippines Since the British Invasion II (1957 Revised ed.). Manila: McCullough Printing Company. Zaide, Gregorio (November 26, 1932). "The Women of the Katipunan". Philippines Free Press (Manila). Zaide, Gregorio F. (1973). Manila during the Revolutionary Period. Manila: citing a letter sent to him by Pío Valenzuela dated December 19, 1931. Zaide, Gregorio (1939). "History of the Katipunan". Loyal Press (Manila). Zaide, Gregorio F. (1931). Documentary History of the Katipunan Discovery. Manila. Zaide, Gregorio (October 25, 1930). "The Rise and Fall of the Katipunan Press". The Sunday Tribune Magazine (Manila). The Catholic Historical Review (Washington, D.C.: American Catholic Historical Association) 4. 1919. ^ a b Cruz 1922 II. "Kailan at saan itinayo ang 'Samahang Kataas-taasang, Kagalang-galangang Katipunan ng̃ mg̃á Anak ng̃ Bayan?'" See also the Transcriber's note in the frontmatter of the source cited. Typographical oddities regarding the placement of the tilde ("~") character in the cited source have been regularized here. ^ a b "‘Kalayaan’, Newspaper of the Katipunan". Tempo. January 18, 2013. ^ a b Ongsotto; et al. Philippine History Module-based Learning I' 2002 Ed. Rex Bookstore, Inc. p. 133. ^ May be transliterated to modern Tagalog orthography as Kataastaasang, Kagalanggalang na Katipunan ng mga Anak ng Bayan. ^ Keat Gin Ooi (2004). Southeast Asia: A Historical Encyclopedia, from Angkor Wat to East Timor. ABC-CLIO. p. 718. ^ Guererro, Milagros; Encarnacion, Emmanuel; Villegas, Ramon (1996). "Andres Bonifacio and the 1896 Revolution". Sulyap Kultura (National Commission for Culture and the Arts) 1 (2): 3–12. ^ Gregorio Zaide translated as Highest and Most Respected Association of the Sons of the Country. ^ a b c d e f Richardson, Jim (February 2007). "Studies on the Katipunan: Notes on the Katipunan in Manila, 1892-96". Retrieved 2009-08-19. ^ a b "Ang Aklat ni Andres Bonifacio" (in Tagalog). Retrieved 13 November 2010. ^ Bonifacio declared that Katagalugan (lit. Tagalog land) is equivalent to all Philippine territories. ^ a b Rojas, Jean. "Filipino Women Warriors". Retrieved 2009-08-19. ^ University, Princeton. The Catholic Historical Review, Volume 4. American Catholic Historical Association, 1919, p. 320. ^ In other sources, this was titled as Pag-ibig sa Tinubuang Bayan. They are both equivalent to English title Love of Fatherland. ^ a b """Documents of the Katipunan: Andrés Bonifacio (attrib.) "Pagibig sa Tinubuang Bayan. Retrieved 2009-08-20. ^ "Documents of the Katipunan: Andrés Bonifacio: Katungkulang Gagawin ng mga Z. Ll. B.". Retrieved 2009-08-20. ^ a b c d e f "Kalayaan: The Katipunan Newspaper". Filipino.biz.ph. Retrieved 2009-08-22. ^ Richardson, Jim (October 2005). "Roster of Katipuneros at Balintawak, August 1896". Retrieved 2009-08-22. ^ a b c d e f g h Rihardson, Jim (November 2005). "Notes on Kalayaan, the Katipunan paper". Retrieved 2009-08-22. ^ May be transliterated as Cartilla, Kartilla, or Cartilya depending on the speaker and user. ^ "The Teachings of the Katipunan". Retrieved 2009-10-20. ^ a b Dr. Pío Valenzuela, Memoirs, Unpublished manuscript. ^ a b "The Revolution". Retrieved 2009-08-22. ^ "Amice, Ascende Superius!". Retrieved 2009-08-21. ^ National Historical Institute; Historical Markers: Regions I-IV and CAR. Manila: National Historical Institute, 1993. Following the victory of the United States against the First Philippine Republic in the Philippine-American War, the Americans exterminated any remaining vestige of the Katipunan. Attracted by the universal appeal of the Katipunan's Kartilya, there were several members who were not native Filipinos at all yet joined the Katipunan in the spirit of national liberation. Among the foreign-born Katipuneros were: General Juan Cailles, an Indian (From India) and French mestizo, General Jose Ignacio Paua who was a full-blooded Chinese and the famous African-American Lieutenant, David Fagen who defected from the Americans to join the Filipinos due to his disgust of racism and imperialism. The crowning achievement of the Katipunan-Magdiwang was the establishment of the first Philippine Republic. The Philippine Republic, more commonly known as the First Philippine Republic or the Malolos Republic was a short-lived nascent revolutionary government in the Philippines. It was formally established with the proclamation of the Malolos Constitution on January 23, 1899 in Malolos, Bulacan, and endured until the capture and surrender of Emilio Aguinaldo to the American forces on March 23, 1901 in Palanan, Isabela, which effectively dissolved the First Republic. At a convention in Tejeros, Cavite, the revolutionaries assembled to form a revolutionary government. There, Bonifacio lost his bid for the presidency of the revolutionary government to Emilio Aguinaldo and instead was elected Secretary of the Interior. When members of the Magdalo faction tried to discredit him as uneducated and unfit for the position, Bonifacio declared the results of the convention as null and void, speaking as the Supremo of the Katipunan. Despite this, Aguinaldo took his oath of office as president the next day in Santa Cruz de Malabon (present-day Tanza) in Cavite, as did the rest of the officers, except for Bonifacio. Andrés Bonifacio and his brother was later arrested upon orders of Gen. Aguinaldo and executed on May 10, 1897 at Mount Buntis in Maragondon,Cavite. He and his brother Procopio was buried in an unmarked grave. Thus ended the original Katipunan. Nevertheless, the Magdiwang Faction took over the reigns from the Katipunan and historians consider the Magdiwang an extension of the Katipunan which it superseded. In the course of the revolution against Spain, a split developed between the Magdiwang faction (led by Gen. Mariano Álvarez) and the Magdalo faction (led by Gen. Baldomero Aguinaldo, cousin of General Emilio Aguinaldo), both situated in Cavite. But the executions, especially Rizal's, only added fuel to the rebellion, with the Katipuneros shouting battle cries: Mabuhay ang Katagalugan! (Long Live Katagalugan!--Katagalugan being the Katipunan term for the Philippines) and Mabuhay si Dr. José Rizal! (Long Live Dr. José Rizal!). To the Katipuneros, José Rizal is the Honorary President of the Katipunan. On February 6, 1897, Apolonio de la Cruz, Roman Basa, Teodoro Plata, Vicente Molina, Hermenegildo de los Reyes, Joes Trinidad, Pedro Nicodemus, Feliciano del Rosario, Gervasio Samson and Doroteo Domínguez were also executed at Bagumbayan. Roxas was executed with Numeriano Adriano, José Dizon, Domingo Franco, Moises Salvador, Luis Enciso Villareal, Braulio Rivera, Antonio Salazar, Ramon P. Padilla, Faustino Villaruel and Faustino Mañalac. Also executed with the group were Lt. Benedicto Nijaga and Corporal Geronimo Cristobal, both of the Spanish army. They arrested and seized the properties of prominent businessmen Francisco Roxas, Telesforo Chuidian and Jacinto Limjap. While there may be circumstantial evidence pointing to Chuidian and Limjap as financiers of the revolution, the record showed no evidence against Roxas except that he was involved in funding the Propaganda Movement. Even Mariano Ponce, another leader of the Propaganda Movement, said the arrest of Roxas was a "fatal mistake". Nonetheless, Roxas was found guilty of treason and shot on January 11, 1897 at Bagumbayan. The Bicol Martyrs were executed by firing squad on January 4, 1897 at Bagumbayan. They were Manuel Abella, Domingo Abella, priests Inocencio Herrera, Gabriel Prieto and Severino Díaz, Camio Jacob, Tomas Prieto, Florencio Lerma, Macario Valentin, Cornelio Mercado and Mariano Melgarejo. The Spanish colonial authorities also pressed the prosecution of those who were arrested after the raid on the Diario de Manila printing press, where they found evidence incriminating not only common folk but also wealthy Filipino society leaders. Six days later, they also executed the Thirteen Martyrs of Cavite at Fort San Felipe Fort in Cavite. While Rizal was being tried by a military court for treason, the prisoners taken in the Battle of Pinaglabanan—Sancho Valenzuela, Ramón Peralta, Modesto Sarmiento, and Eugenio Silvestre—were executed on September 6, 1896 at Bagumbayan. Even before the discovery of the Katipunan, Rizal applied for a position as doctor in the Spanish army in Cuba in a bid to persuade the Spanish authorities of his loyalty to Spain. His application was accepted and he arrived in Manila to board a ship for Spain in August 1896, shortly before the secret society was exposed. But while Rizal was en route to Spain, the Katipunan was unmasked and a telegram overtook the steamer at Port Said, recalling him to the Philippines to face charges that he was the mastermind of the uprising. He was later executed by musketry on December 30, 1896 at the field of Bagumbayan (now known as Luneta). The Kakarong Lodge No. 168 of the 'Legionarios del Trabajo' in memory of the 1,200 Katipuneros who perished in the battle erected a monument of the Inang Filipina Shrine - (Mother Philippines Shrine) in 1924 in the barrio of Kakarong of Pandi, Bulacan. The actual site of the 'Battle of Kakarong de Sili' is now a part of the barangay of 'Real de Kakarong'. No less than one of the greatest generals in the Philippines' history, General Emilio Aguinaldo who became first Philippine president visited this sacred ground in the late fifties. History and researchers, as well as records of the Malolos Republic and the Biak-na-Bato Republic. In recognition thereof, these three "Republics" established in Bulacan have been incorporated in the seal of the province of Bulacan. During the Cry of Pugad Lawin referred to as 'The Cry of Balintawak' - Andrés Bonifacio a Filipino nationalist and revolutionalist who led in 'The Cry of Balintawak'. In Bulacan, the Bulacan Revolutionary Movement were attacked by the strongest artillery forces ever converged in the capital town of Bulacan. This subsequently led to the Battle of San Rafael, where Gen. Anacleto Enriquez and his men were surrounded and attacked in the Church of San Rafael. On August 30, the Katipunan attacked the 100 Spanish soldiers defending the powder magazine in the Battle of San Juan del Monte or Battle of Pinaglabanan. About 153 Katipuneros were killed in the battle, but the Katipunan had to withdraw upon the arrival of Spanish reinforcements. More than 200 were taken prisoner. At about the same time, Katipuneros in other suburban Manila areas, like Caloocan, San Pedro de Tunasan (now Makati City), Pateros and Taguig, rose up in arms. In the afternoon of the same day, the Spanish Gov. Gen. Camilo de Polavieja declared martial law in Manila and the provinces of Cavite, Laguna, Batangas, Bulacan, Pampanga, Tarlac and Nueva Ecija. The Philippine Revolution had begun. But Spanish civil guards discovered the meeting and the first battle occurred with the Battle of Pasong Tamo. While the Katipunan initially had the upper hand, the Spanish civil guards turned the fight around. Bonifacio and his men retreated toward Marikina via Balara (now in Quezon City). They then proceeded to San Mateo (in the province now called Rizal) and took the town. The Spanish, however, regained it three days later. After regrouping, the Katipuneros decided not to attack Manila directly but agreed to take the Spanish powder magazine and garrison at San Juan. When the Katipunan leaders learned of the arrests, Bonifacio called an assembly of all provincial councils to decide the start of the armed uprising. The meeting was held at the house of Apolonio Samson at a place called Kangkong in Balintawak. About 1,000 Katipuneros attended the meeting but they were not able to settle the issue. From August 24, 1896, the Katipunan became an open insurgent government, and regarded themselves as a genuine government. Even though the society did have a unified structure, own laws and a centralized leadership, it turned to be working only when the revolution began. Historian Teodoro Agoncillo gives a differing version of events, writing that Patiño revealed the secrets of the society to his sister, Honoria, following on a misunderstanding with Apolonio de la Cruz, another society member who worked with him in the Spanish-owned Diario de Manila periodical. Honoria, an orphanage inmate, was upset at the news and informed Sor Teresa, the orphanage madre portera, who suggested that Patiño tell all to Father Mariano Gil. On August 19, Patiño told Father Mariano what he knew of the secret society. Father Mariano and the owner of the Diario de Manila searched the printing shop, discovering the lithographic stone used to print pring Katipunan receipts. After this discovery the locker of Policarpio Turla, whose signature appeared on the receipts, was forced open and found to contain a dagger, the rules of the society, and other pertinent documents. These were turned over to the police, leading to the arrest and conviction on charges of illegal association and treason of some 500 prominent men. Patiño's alleged betrayal has become the standard version of how the revolution broke out in 1896. In the 1920s, however, the Philippine National Library commissioned a group of former Katipuneros to confirm the truth of the story. José Turiano Santiago, Bonifacio's close friend who was expelled in 1895, denied the story. He claimed that Bonifacio himself ordered Patiño to divulge the society's existence to hasten the Philippine revolution and preempt any objection from members. Alarmed by the stunning truth of existence of a secret society, Father Gíl, accompanied by local Spanish authorities, searched the printing office of Diario de Manila and found the incriminating evidence. They also found Apolonio de la Cruz in possession of a dagger used in Katipunan initiation rites and some list of new accepted members. After the arrest, Father Gíl rushed to Governor-General Blanco to denounce the revolutionary plot of the Katipunan. The Spanish unleashed a crackdown and arrested dozens of people, where many innocent citizens were forced to go to Fort Santiago. Controlled by his fear of Hell, Teodoro went to Father Mariano Gíl, an Augustinian parish curate of the Tondo convent. Though he is willed to tell anything about the Katipunan, Teodoro confessed to Father Gíl that a lithographic stone was hidden in the press-room of Diario de Manila, which was used by the society for printing receipts. He also said that aside from the stone, there were also documents of membership (that uses member's blood for signing) hidden, together with a picture of Dr. José Rizal and several daggers that was made for the katipunero-employees of the newspaper. The Katipunan was finally discovered by the Spanish authorities six days after Fernández's letter to Luengo. On early August 1896, two Katipuneros, namely Teodoro Patiño and Apolonio de la Cruz, who were working for the Diario de Manila printing press (leading newspaper during those times) had undergone misunderstanding regarding wages. Press foreman de la Cruz and typesetter Patiño fought over salary increase of two pesos, and de la Cruz tried to blame Patiño for the loss of the printing supplies that were used for the Kalayaan. As an action against de la Cruz, Patiño revealed the secrets of the society to his sister, Honoria Patiño, an inmate nun at the Mandaluyong Orphanage. That afternoon, on August 19, 1896, Honoria grew shocked and very upset to the revelation. The mother portress of the Orphanage, Sor Teresa de Jesus saw Honoria crying so she approached her. Honoria told everything she heard from her brother. At around 6:15 pm that day, Sor Teresa called Teodoro Patiño and advised him to tell everything he knew about the Katipunan through confession to Father Mariano Gíl. As the Katipunan was busy preparing for the revolution, various denunciations regarding its existence reached the Spanish authorities. On July 5, 1896, Manuél Sityar, a Spanish lieutenant of the guardia civíl stationed at Pasig, reported to Governor-General Ramón Blanco y Erenas the mysterious activities of certain Filipinos who had been gathering arms and recruiting men for some unknown purposes. On August 13, 1896, Fr. Agustín Fernández, an Augustinian curate of San Pedro, Makati, wrote to Don Manuél Luengo, Civil Governor of Manila, denouncing anti-Spanish meetings in his parish. It was with good reason that the Katipunan solicited Japan's aid and alliance. Japan had been friendly to the Filipinos since the Spanish colonial era. Many Filipinos who had fled from Spanish persecution had been welcomed there and given full protection of Japanese laws. Bonifacio tried to purchase arms and ammunition from Japan, but failed due to lack of funds and the uncovering of the Katipunan, Jose Dizon was part of the committee that the Katipunan formed to secure arms from Japan with the connivance of the Japanese ship captain. Three months later, however, the Katipunan was uncovered and Dizon was among the hundreds who were arrested for rebellion. After the usual exchange of courtesies, Jacinto submitted the Katipunan memorial for the Emperor of Japan in which the Filipinos prayed for Japanese aid in their projected revolution, "so that the light of liberty that illuminates Japan may also shed its rays over the Philippines." Despite Rizal's rejection of an armed revolution, Bonifacio continued to plan for an armed conflict with Spain. The Katipunan cast its eyes on Japan, which loomed then as the probable champion of Asian liberties against Western oppression at the time. In May 1896, after Valenzuela's visit to Rizal, a delegation of Katipunan members, headed by Jacinto and Bonifacio, conferred with a visiting Japanese naval officer and captain of a Japanese ship, named Kongo, and the Japanese consul at a Japanese bazaar in Manila. The interpreter, a friend of Valenzuela, was José Moritaro Tagawa who was married to a Filipino woman of Bocaue, Bulacan. At his trial, Rizal denied that he knew Valenzuela, saying only that he met him first at Dapitan and that he considered him a good friend because of what Valenzuela showed to him and his appreciation of medical tools Valenzuela gave to him. He also said that this was the last time they met. When Valenzuela returned to Manila and informed the Katipunan of his failure to secure Rizal's sanction, Bonifacio, furious, warned Valenzuela not to tell anyone of Rizal's refusal to support the impending uprising. However, Valenzuela had already spread the word, so that much fund proposals to the society were canceled. Despite Rizal's rejection, the Katipunan was already trying to address its arms supply problem and had taken steps to smuggle in weapons from abroad. Because of this notion, Valenzuela made another proposal to Rizal: to rescue him. Rizal disapproved of this plan, because he had given his word of honor to the Spanish authorities, and he did not want to break it. Instead, Rizal advised Valenzuela to persuade wealthy Filipinos, so that they can solicit funds, where he recommended an elite army officer name Antonio Luna to be Katipunan's war general, should a revolution break out. According to Valenzuela's statement to the Spanish authorities, they almost quarreled over the matter and Valenzuela left the following day instead of staying for a month as originally planned. arms and funds must first be collected before raising the cry of revolution. The night when Governor-General Eulogio Despujol y Dusay exiled Dr. José Rizal to Dapitan, Katipunan was founded. Presented below is the Katipunan alphabet, when compared to the Spanish alphabet. 30. What is the language used by the members of the Katipunan? Tagalog; however, the meanings of some letters from the Spanish alphabet have been changed. The letter "a" becomes "z", "c" and "q" become "k", the letter "i" is "n", the letters "l" and "ll" are "j" letter "m" is "v", letter "n" is "ll", letter "o" is "c" and letter "u" is "x". The letters f, j, v, x and z are not needed, and unused. Kartilya was written by Emilio Jacinto, and later revised by Emilio Aguinaldo. The revised version consists of thirteen teachings (though some sources, such as the one provided by Philippine Centennial Commission, list only twelve). The term kartilya was derived from Spanish cartilla, which was a primer for grade school students before going to school at that time. 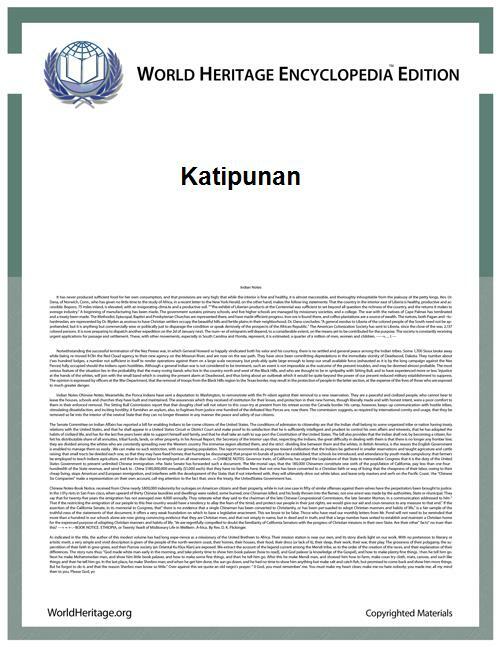 The teachings of the Katipunan were embodied in a document entitled Kartilya ng Katipunan, a pamphlet printed in Tagalog language. Copies of which were distributed among the members of the society. On August 1896, the second issue was prepared. It was during this time that Spanish authorities began to grow wary of anti-government activities and, suspecting the existence of a subversive periodical in circulation (see below), raided the place where Kalayaan was being printed, at No. 6 Clavel Street, San Nicolas, Manila. Fortunately, the printers, Duque and Fernández, were warned in time, had destroyed the incriminating molds, and escaped. Therefore, Spanish authorities never found any evidence of the Kalayaan. The first issue contained a supposed editorial done by del Pilar, which, in fact, was done by Jacinto himself. It also included Bonifacio's Pag-ibig sa Tinubuang Lupa, Valenzuela's Catuiran? and several works that exposed Spanish abuses and promoted patriotism. Copies spread to nearby Manila provinces, including Cavite, Morong (now Rizal), Kalookan, and Malabon. Surprised by this initial success, Jacinto decided to print a second issue that would contain nothing but his works. According to Valenzuela, the printing process was so laborious that setting just eight pages of typesets required two months to complete. For weeks, Jacinto, Duque and Fernández (and sometimes Valenzuela) took turns in preparing the pages of the Kalayaan, which was approximately nine by twelve inches in size. In March 1896, the first copies were issued (dated January 1896), and about 2,000 prints were circulated in secret, according to Valenzuela. According to Epifanio de los Santos, only 1,000 copies were printed: 700 was distributed by Bonifacio, 300 by Aguinaldo, and some 100 by Valenzuela himself. When Valenzuela was appointed the physician-general of the Katipunan, he passed on his editorial duties to Emilio Jacinto. Jacinto took the job, editing articles after his pre-law classes in University of Santo Tomas. Since the press was in the old orthography and not in the new "Germanized" alphabet, as called by the Spaniards, there are no Tagalog letters such as "k", "w", "h" and "y". To solve this problem, Jacinto obliged his mother, Josefa Dizon, to buy types that resembles such letters. The types used in printing were purchased from publisher Isabelo de los Reyes, but many were taken surreptitiously from the press of the Diario de Manila by Filipino employees who were also members of the Katipunan. That very same month, January 1896, the publication of Kalayaan was started. Valenzuela expected it to finish at the end of the month, so they dated it as January. The existence of the press was kept in utmost secrecy. Under the supervision of Valenzuela, two printers, Faustino Duque, a student from Colegio de San Juan de Letran, and Ulpiano Fernández, a part-time printer at El Comercio, printed the revolutionary literature of the society and Kalayaan. The name Kalayaan was suggested by Marcelo H. del Pilar as its editor. To fool the Spanish authorities, the Kalayaan was also decided to carry a false masthead stating that it was being printed in Yokohama, Japan. In 1895, the Katipunan bought an old hand-press with the money generously donated by two  Bonifacio agreed, and on mid-January, the press was delivered in San Nicolas. Kalayaan (Liberty/Freedom) was the official organ and newspaper of the Katipunan. It was first published March 1896 (even though its masthead was dated January 1896.) The first Kalayaan issue has never been followed. "Ang Kalayaan" redirects here. For other uses, see Kalayaan. Imprenta Press (1860) V John Sherwin (Casa Real Shrine-Museum, Malolos City) printing machine used by the First Philippine Republic (now the Case Real Shrine), where the newspapers La Independencia, El Heraldo de la Revolucion, Kalayaan, and Kaibingan ng Bayan were printed. During the Japanese occupation, the "Bulacan Military Area", under Capt. Alejo Santos, used this machine, against the Japanese. 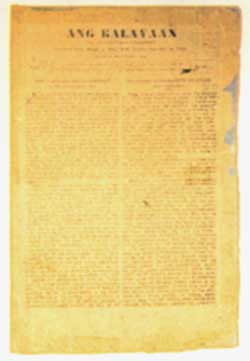 Facsimile of the first page of Kalayaan. During the infamous Cry of Balintawak, Valenzuela had the position as physician-general of the Katipunan. Jacinto works. Emilio Jacinto is considered the Brains of the Katipunan, later the Revolution. His poetical masterpiece, written in Laguna on October 8, 1897, was A la Patría (To My Fatherland), with an inspiring melody paralleled from Rizal's Mi último adiós He also wrote a touching ode entitled A mí Madre (To My Mother). His masterpiece in prose, the Kartilla (Kartilya, Primer) became the Bible of the Katipunan. (see below) His other prose writing was Liwanag at Dilim (Light and Darkness), a series of articles on human rights, liberty, equality, labor, government, and love of country. His nom-de-plume was Dimas-Ilaw. Valenzuela works. Dr. Pío Valenzuela was a medical doctor by profession. In 1896, during the first publication of Kalayaan, Valenzuela assisted Bonifacio and Jacinto in editing the newspaper. He also wrote Catuiran? (Is it Fair? ), which described the cruelties of the Spanish priest and civil guards of San Francisco del Monte (now in Quezon City) on a helpless village lieutenant. He also collaborated with Bonifacio in writing the article Sa Mga Kababayan (To my Countrymen), an essay addresses to the motherland. His nom-de-plume was Madlang-Away. After Rizal's execution at Bagumbayan on December 30, 1896, Bonifacio wrote the first Tagalog translation of the former's Mi último adiós (Final Farewell), in which he gave the name Pahimakas (Farewell). He also wrote the prose Katungkulang Gagawin ng mga Z. Ll. B. (Duties of the Sons of the People), that was never published because he believed that Jacinto's Kartilya was superior than his. Bonifacio also wrote Ang Dapat Mabatid ng Mga Tagalog (What the Tagalogs Should Know), which is a politic-historical essay. Bonifacio works. Probably one of the best works done inside the Katipunan was written by Andrés Bonifacio, the Pag-ibig sa Tinubuang Lupa (Love of Fatherland), a poem of sincere patriotic sentiment. Pag-ibig was published in the Kalayaan only issue of January 1896 under his nom-de-plume Agapito Bagumbayan. According to Manuel Artigas y Cuerva, the name Agapito Bagumbayan was a corruption of combination agap-ito, bagum-bayan, which, if translated from Tagalog to English word by word, means "the new nation is here, and ready. There is no known original source of Pag-ibig, especially that there is no surviving Kalayaan issue. The two available texts accessible reprinted through books is the one published by Jose P. Santos in 1935. The other one, with familiar discrepancies to Santos' print, was archived in military annals of Madrid. During Katipunan's existence, literature flourished through prominent writers of the Katipunan: Andrés Bonifacio, Emilio Jacinto and Dr. Pío Valenzuela. Each of the three's works were stirring literature of patriotism and are aimed to spread the revolutionary thoughts and ideals of the society. Melchora Aquino (1812–1919) - also known as Tandang Sora (Old Sora) and nicknamed as the Grand Woman of the revolution as well as Mother of Balintawak, she has been notable for her heroic contribution to wounded and ailing Katipuneros during revolution. Andres Bonifacio (1863–1897) - Supremo, third leader and founder of the Katipunan. Emilio Aguinaldo (1869–1964) - First and only president of the then First Philippine Republic, Katipunan's successor. He was also a war general and head of the Magdalo faction that led to a strife among the Katipuneros. During his presidency, he ordered the execution of Andrés Bonifacio in 1897. 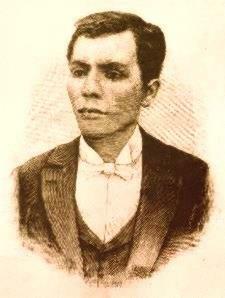 Emilio Jacinto (1875–1899) - called as the Brains of the Katipunan. He wrote several papers during the Revolution like the Kartilya (Primer). Gregoria de Jesús (1875–1943) - called as the Lakambini ng Katipunan (Muse of the Katipunan) and nicknamed Aling Oryang, she was the wife of Bonifacio before marrying Julio Nakpil after the former's death. She was also regarded as one of the first women members of the Katipunan. Gregorio del Pilar (1875–1899) - entered the Katipunan circle when he joined the First Philippine Republic's army against the Americans. He died during the Battle of Tirad Pass. Licerio Gerónimo (1855–1924) - Aguinaldo's war general during Philippine–American War. Vicente Lukbán (1860–1916) - Americans regarded him to be the mastermind of the bloody Balangiga massacre in 1901 during Philippine–American War. Antonio Luna (1866–1899) - Aguinaldo's brigadier general, he led the war against the Americans during Philippine–American War; was killed by kawit troops. 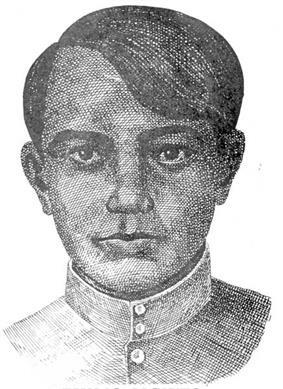 Miguel Malvar y Carpio (1865–1911) - commander of the Katipunan and was one of the causes of strife among the society members. Enrique Pacheco - Alias Resurreccion Macabuhay. Secretary of Finance, and head of the Macabuhay Council. Macario Sakay- head of Katipunan in Trozo, Manila. Future founder of Republika ng Katagalugan that would oppose American occupation in the Philippines. Paciano Rizal - The older brother of national hero José Rizal, he was also a personal friend of Padre José Burgos in his youth. He joined the Katipunan years before Jose's return from Dapitan. Manuel Tinio (1877–1924) - youngest general of the Katipunan, he later became the governor of Nueva Ecija from 1907-1909. 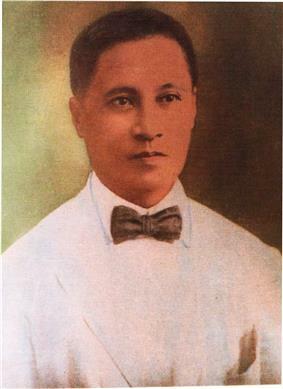 Julian Felipe (1832–1835) - composer of Lupang Hinirang, teacher and member of La Liga Filipina, he later served as legal advisor to the Katipunan. His tenacious ability in argumentative reasoning earned him the nickname "demente viejo" among the colonial Principalía. In spite of being devout Catholic, Carpio, like other Filipino revolutionaries, was a member of the Freemasons before the formation of the Katipunan. In Manila, Julian ran a private law school which many of his personal socio-political ideals succeeded to his students. Notable Katipuneros under his tutelage was Gregorio Aglipay and Miguel Malvar. Though women are considered to be members of the Katipunan, information regarding the women's section were scarce and sometimes conflicting. Teodoro Agoncillo, for example, disregarded Marina Dizon and concluded that Josefa Rizal was the only president of the said section. Gregorio Zaide, on the other hand, mentioned Dizon's presidency in his 1939 publication History of the Katipunan but changed his mind when he adopted Dr. Pío Valenzuela's notion that women-members did not elect officers, hence there is no room for president. The women rendered valuable services to the Katipunan. They guarded the secret papers and documents of the society. Whenever the Katipunan held sessions in a certain house, they usually made merry, singing and dancing with some of the men in the living room so that the civil guard were led that there was nothing but a harmless social party within. The first woman to become member of the Katipunan was Gregoria de Jesús, wife of Bonifacio. She was called the Lakambini ng Katipunan (Princess of the Katipunan). Initially, there were 29 women were admitted to the Katipunan: Gregoria de Jesús, Maria Dizon, president of the women's section; Josefa and Trinidad Rizal, sisters of Dr. José Rizal; Angelica Lopez and Delfina Herbosa Natividad, close relatives of Dr. Rizal; Carmén de Rodriguez; Marina Hizon; Benita Rodriguez; Semiona de Rémigio; Gregoria Montoya; Agueda Kahabagan, Teresa Magbanua, Trinidad Tecson, rendered as "Mother of Biak-na-Bato"; Nazaria Lagos; Patronica Gamboa; Marcela Agoncillo; Melchora Aquino, the "Grand Old Woman of Balintawak"; Marta Saldaña and Macaria Pañgilinan. At first, Katipunan was purely a patriotic society for men. Owing to the growing suspicion of the women regarding nocturnal absences of their husbands, the reduction of their monthly earnings and "long hours of work", Bonifacio had to bring them into the realms of the KKK. A section for women was established in the society: to become admitted, one must be a wife, a daughter, or a sister of a male katipunero. It was estimated that from 20 to 50 women had become members of the society. The next step in the initiation ceremony was the lecture given by the master of ceremonies, called Mabalasig/Mabalasik (terrible brother), who informed the neophyte to withdraw if he lacked courage since he would be out of place in the patriotic society. If the neophyte persisted, he was presented to the assembly of the brethren, who subjected him to various ordeals such as blindfolding him and making him shoot a supposedly a revolver at a person, or forcing him to jump over a supposedly hot flame. After the ordeals came to final rite–the pacto de sangre or blood compact–in which the neophyte signed the oath with blood taken from his arm. He was then accepted as a full-pledged member, with a symbolic name by which he was known within Katipunan circles. Bonifacio's symbolic name was Maypagasa; Jacinto was Pingkian and Artemio Ricarte was Vibora. During Bonifacio's time, all of the Filipino people are referred collectively by the Katipunan as Tagalogs, while Philippines is Katagalugan. Katipon could graduate to Kawal class by bringing several new members into the society. 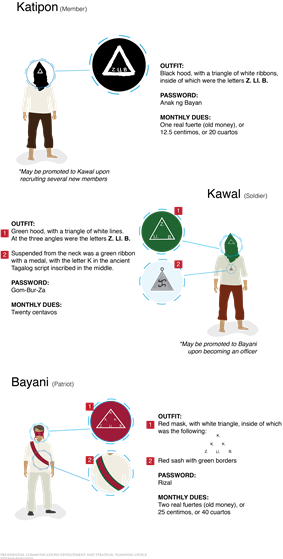 A Kawal could become a Bayani upon being elected an officer of the society. Katipon. First degree members. Other symbols: Black hood, revolver and/or bolo. Kawal. Second degree members. Other symbols: green ribboned-medallion with Malayan K inscription. Bayani. Third degree members. Other symbols: Red hood and sash, with green borders. When the Katipuneros had expanded to more than a hundred members, Bonifacio divided the members into three grades: the Katipon (literally: Associate) which is the lowest rank, the Kawal (soldier), and the Bayani (Hero or Patriot). In the meeting of the society, Katipon wore a black hood with a triangle of white ribbon having the letters "Z. Ll. B. ", corresponding to the roman "A. N. B. ", meaning Anak ng̃ Bayan (Son of the People, see below). Kawal wore a green hood with a triangle having white lines and the letters "Z. LL. B." at the three angles of the triangle, and also wore a green ribbon with a medal with the letter (ka) in Baybayin script above a depiction of a crossed sword and flag. The password was Gom-Bur-Za, taken from the names of the three martyrs Mariano Gomez, Jose Burgos and Jacinto Zamora. Bayani (Hero) wore a red mask and a sash with green borders, symbolizing courage and hope. The front of the mask had white borders that formed a triangle with three Ks arranged as if occupying the angles of a triangle within a triangle, and with the letters "Z. Ll. B." below. Another password was Rizal. Countersigns enabled members to recognize one another on the street. A member meeting another member placed the palm of his right hand on his breast and, as he passed the other member, he closed the hands to bring the right index finger and thumb together. 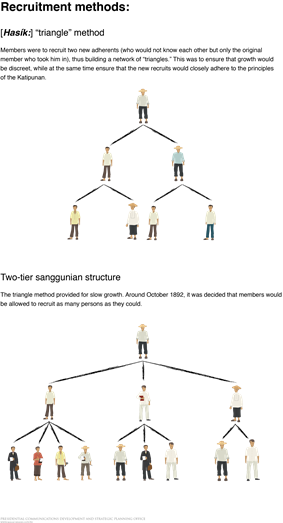 It was the original plan of Bonifacio to increase the membership of the Katipunan by means of sistemang patatsulok or triangle system. He formed his first triangle with his two comrades, Teodoro Plata and Ladislao Diwa. Each of them re-instituted Katipunan thoughts into another two new converts. The founder of the triangle knew the other two members, but the latter did not know each other. On December 1892 the system was abolished after proving it to be clumsy and complicated. A new system of initiation, modelled after the Masonic rites was then adopted. Aside from Manila, the Katipunan also had sizeable chapters in Batangas, Laguna, Cavite, Rizal, Bulacan, Pampanga, Tarlac and Nueva Ecija. There were also smaller chapters in Ilocos Sur, Ilocos Norte, Pangasinan and the Bicol region. The Katipunan founders spent their free time recruiting members. For example, Diwa, who was a clerk at a judicial court, was assigned to the office of a justice of the peace in Pampanga. He initiated members in that province as well as Bulacan, Tarlac, and Nueva Ecija. Most of the Katipuneros were plebeian although several wealthy patriots joined the society and submitted themselves to the leadership of Bonifacio. 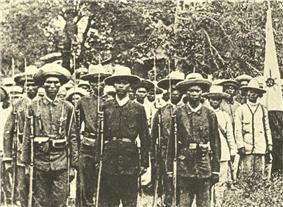 A late 19th century photograph of armed Filipino rebels, known as the Katipuneros. Eight months later, in August 1896, the fifth and last supreme council was elected to renamed offices. Bonifacio was named Supremo, Jacinto Secretary of State, Plata Secretary of War, Bricco Pantas Secretary of Justice, Aguedo del Rosario Secretary of Interior and Enrice Pacheco Secretary of Finance. The members of the Supreme Council in 1895 were Bonifacio as president, Valenzuela as fiscal and physician, Jacinto as secretary, and Molina as treasurer. Enrico Pacheco, Pantaleon Torres, Balbino Florentino, Francisco Carreón and Hermenegildo Reyes were named councilers. On December 31, 1895, another election named Bonifacio as president, Jacinto as Fiscal, Santiago as secretary, Molina as secretary, Pío Valenzuela and Pantaleon Torres as physicians, and Aguedo del Rosario and Doreteo Trinidad as councilors. In 1895, José Turiano Santiago, a close personal friend of Bonifacio, was expelled because a coded message of the Katipunan fell into the hands of a Spanish priest teaching at the University of Santo Tomas. Since the priest was a friend of Santiago's sister, he and his half-brother Restituto Javier were suspected of betrayal, but the two would remain loyal to the Katipunan and Santiago would even join the Philippine revolutionary forces in the Philippine–American War. Jacinto replaced Santiago as secretary. The Filipino scholar Maximo Kalaw reports that Basa yielded the presidency to Bonifacio in 1894 because of a dispute over the usefulness of the initiation rites and Bonifacio's handling of the society's buts. Basa contested Bonifacio's practice of lending their funds to needy members, complete with promissory notes. Moreover, Basa refused to induct his son into the organization. In 1893, the Supreme Council comprised Ramón Basa as president, Bonifacio as fiscal, Gregoria de Jesús, whom Bonifacio had just married, and Marina Dizon, daughter of José Dizon. It was also in 1893 when Basa and Diwa organized the provincial council of Cavite, which would later be the most successful council of the society. Within the society functioned a secret chamber, called Camara Reina, which was presided over by Bonifacio, Jacinto, and Pío Valenzuela. This mysterious chamber passed judgment upon those who had betrayed their oath and those accused of certain offenses penalized by Katipunan laws. Every katipunero stood in fearful awe of this chamber. According to José P. Santos, throughout the existence of the secret chamber, about five katipuneros were convicted and sentenced to die by it. The death sentence was handed down in the figure of a cup with a serpent coiled around it. The towns/cities which supported the Katipunan cause were given symbolic names, such as Magdiwang (To celebrate) for Noveleta; Magdalo (To come) for Kawit; Magwagi (To win) for Naic; Magtagumpay (To succeed) for Maragondon; Walangtinag (Never-diminished) for Indang and Haligue (Wall) for Imus–all are in the province of Cavite. In each province where there were Katipunan members, a provincial council called Sangguniang Bayan was established and in each town was an organized popular council called Sangguniang Balangay. Each Bayan and Balangay had its own set of elected officials: Pangulo (president); Kalihim (secretary); Tagausig (fiscal); Tagaingat-yaman (treasurer); Pangalawang Pangulo (vice president); Pangalawang Kalihim (vice secretary); mga kasanguni (councilors); Mabalasig (terrible brother); Taliba (guard); Maniningil (collector/auditor); Tagapamahala ng Basahan ng Bayan(custodian of the People's Library); Tagapangasiwa (administrator); Manunulat (clerk); Tagatulong sa Pagsulat (assistant clerk); Tagalaan (warden); and Tagalibot (patroller). Each Balangay were given a chance to expand their own spheres of influence, through triangle system in order to elevate their status to Sangguniang Bayan. Every Balangay that did not gain Sanggunian Bayan status were dissolved and annexed by greater provincial or popular councils. At the outbreak of the revolutionary government, de facto and de jure. The Katipunan was governed by the Supreme Council (Tagalog: Kataastaasang Sanggunian). The first Supreme Council of the Katipunan was formed around August 1892, a month after the founding of the society. The Supreme Council was headed by an elected president (Pangulo), followed by the secretary/secretaries (Kalihim); the treasurer (Tagaingat-yaman) and the fiscal (Tagausig). The Supreme Council also had its councilors (Kasanguni); the number varied through presidencies. To distinguish from presidents of lower sanggunian or councils (below) the president of the Supreme Council was called the Supreme President (Tagalog: Kataastaasang Pangulo; Spanish: Presidente Supremo). The rise of the Katipunan signaled the end of the crusade to secure reforms from Spain by means of a peaceful campaign. The Propaganda Movement led by Rizal, del Pilar, Jaena and others had failed its mission; hence, Bonifacio started the militant movement for independence. to establish a republic after independence. 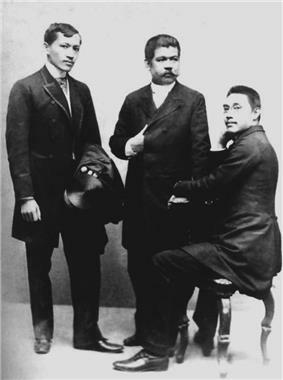 A late 19th century photograph of leaders of the Propaganda Movement: José Rizal, Marcelo H. del Pilar and Mariano Ponce. Photo was taken in Spain in 1890. In planning the revolution, Bonifacio contacted Rizal for his full-fledged support for the Katipunan in exchange for a promise of rescuing Rizal from his detainment. In May 1896, a delegation was sent to the Emperor Meiji to solicit funds and military arms. The Katipunan's existence was revealed to Spanish authorities after a member named Teodoro Patiño confessed the Katipunan's illegal activities to his sister, and finally to the other portress of Mandaluyong Orphanage. Seven days later, on 26 August 1896, Bonifacio and his men tore their cédulas in the famous Cry of Pugadlawin that started the Philippine Revolution. Being a secret organization, its members were subjected to stringent discretion and were expected to abide with the rules established by the Society. Aspirant applicants were given standard initiation rites to become members of the Association. At first, membership in the Katipunan was only open to male Filipinos; later, women were admitted. The Katipunan had its own publication, Kalayaan ("Liberty") that had its only print in March 1896. Revolutionary ideals and works flourished within the society, and Philippine literature were expanded by some of its prominent members. The name "Katipunan" comes from the full Tagalog name for the society: "Kataastaasan Kagalang-galang Katipunan nang mga Anak nang Bayan" (English: "Highest and Most Respectable Society of the Children of the nation "). In planning the revolution, Bonifacio contacted Rizal for his full-fledged support for the Katipunan in exchange for a promise to rescue Rizal from his detainment. In May 1896, a delegation was sent to the Emperor of Japan to solicit funds and military arms. The Katipunan's existence was revealed to the Spanish authorities after a member named Teodoro Patiño confessed the Katipunan's illegal activities to his sister, and finally to the mother portress of Mandaluyong Orphanage. Seven days after the Spanish authorities learned of the existence of the secret society, on August 26, 1896, Bonifacio and his men tore their cédulas during the infamous Cry of Pugadlawin that started the Philippine Revolution.